Last autumn, I found, hauled and shredded leaves from my block to make four large compost bins. I mixed the leaves with coffee grounds and let them sit over winter, mixing several times this spring, and had beautiful compost mulch for nearly all my gardens. 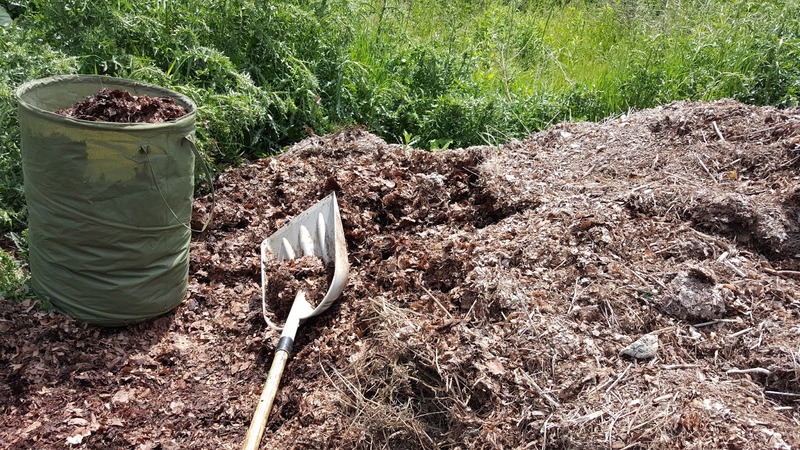 I was so pleased with the resulting compost that I wished I had hauled more leaves home last autumn, as dry leaves that don't contain grasses and weeds are hard to find in the spring and summer. A treasure of shredded leaves waiting for me to haul away. The other day while eradicating Canadian thistle in my community garden, I wondered over to our compost pile where I was sure to find some. Indeed, I found the mother of all thistle colonies. While there, I also discovered a beautiful pile of shredded leaves. It must be where the landscapers for the surrounding area dumped them. I immediately recognized the solution to my lack of leaves problem. Today, while running errands around Madison's east side, I backed my car up to the pile and dug in. The leaves on top were crispy and not very decomposed, but just a few inches into the pile and they were wet, decaying and smelled wonderful. 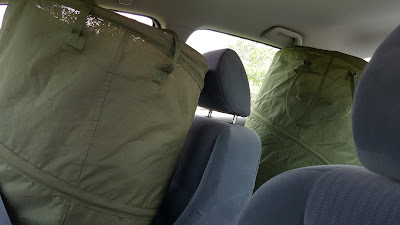 I filled two collapsible containers and the trunk (which I had lined with a tarp). Passengers, you can't see in the photo, but they are belted in! I stopped at the two Starbucks that are on my way home from work and one of them paid off with four bags of coffee grounds. Not enough for all the leaves I had collected, but a good start. 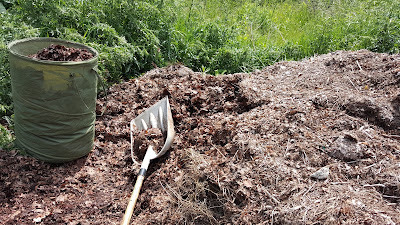 Back at home, I filled a compost bin, put down a layer of coffee grounds, then a load and a layer of too fresh horse manure, then a load and coffee grounds. I'll add water (or let it rain, whichever comes first) mix it up a few times and it will be a steaming pile in a few days; and should be beautiful compost to put my beds to sleep with this autumn. My plan is to repeat leaf and coffee ground collection until all four of my bins are full. This should be enough for autumn mulching. After I empty them this autumn, I'll fill them again with leaves from the block. My ultimate goal is that I don't need to buy hay for mulch any more. I almost made it this year, but ended up buying two bales at the last minute when I ran out of my own compost.